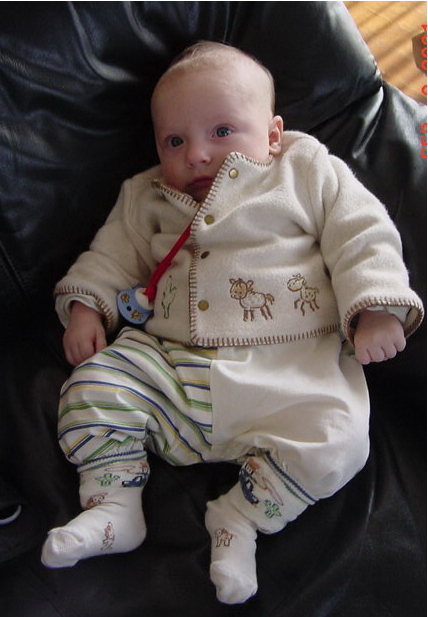 In 2001, my husband Michael and I put everything we owned into storage and moved to Japan for just shy of a year with our newborn baby, Nathan. Since this happened before the age of blogging, my records of that time consist of emails I sent to the few people we knew who had email, and the journal entries I kept. In light of the recent events in Japan, my thoughts naturally turn to our precious time in that country. For the next month I'll be posting various highlights of our time there. Thanks for coming along with me on this international stroll down memory lane! Just a quick note to let you all know we are alive and well! Nathan was wonderful on the flight and didn't scream once! Just about 1 minute of fussy-ness. All my coworkers who were on the same flight were disappointed that they didn't get a chance to hold him. They kept checking to see if he was crying so they could take him for a walk... nope! Our boy likes to be on the go! 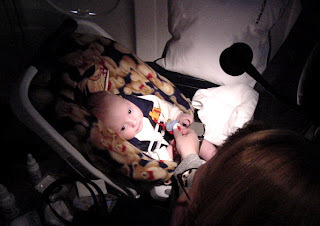 Nathan's first flight: 11 hours in Business Class! He got his own seat. No lap sitting for this little prince! 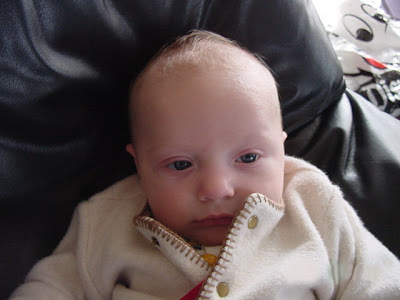 Please just give me back my pacifier and get that light out of my face so I can go back to chillin'. I'm fine! ﻿﻿﻿﻿Our apartment is GREAT and is only about a 3-5 min walk to the train station, grocery stores, and shopping center. Heather is loving Japan (so far) and has decided the American people here in Japan are complete snobs compared to the Japanese. She tries to smile and converse with the Americans she sees at the train and bus stations and they always turn their nose or avert eye contact ... hmph! This is what Jet Lag looks like on an 11 week old baby. ﻿﻿ I have been incredibly busy at work, the project is moving at a pace I can barely keep up with (considering we haven't REALLY settled in yet). So, a lot of late/long hours for me ... that Heather isn't too thrilled about (someone's got to take Nathan off her hands for a little while, you know). Nathan, we believe, has started teething (or at least cries and drools as though he has). So he has been an additionally pleasurable bundle of joy lately. We spent the day at Tokyo Disneyland yesterday and had a good time (I'll let Heather fill in more details soon). When we landed in Japan, there was snow on the ground! We weren't prepared for the weather at all. So we just put layer upon layer on Nathan. Brrrrr-ito! ﻿Our shipment of clothes and personal effects has just arrived in port today. It takes about 5+ business days to go through customs, so we won't have our computer set up until sometime mid next week (at the earliest). So, please be patient and Heather will start writing MANY emails to everyone giving the play by play of what she is experiencing here. We love you all and hope you are all doing well. I could not believe our luck at being able to fly from Los Angeles to Tokyo without a peep from our baby! I sat next to him and Michael sat across the aisle from us. I'd feed him, and then Michael would take him to the bathroom to change his diaper, and then back he went into his car seat (you could still take a car seat on the plane in 2001). 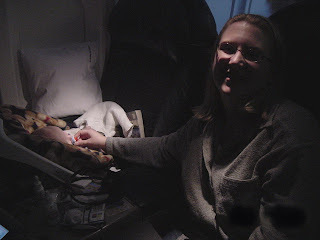 Whenever people ask for advice on flying with kids, I can only say, "The younger, the better!" based on our charmed experience. I had to go several weeks without my computer because it was sent via boat with all the rest of our belongings. I guess it wasn't as big a deal then as it would be now... after all, without Facebook, Twitter, and very few people to email, what could I possibly have wanted to do on the computer, right? It wasn't until months later that I found out why I was getting the cold shoulder from all the American Expats (I'll share about it when I get to it). Reading Michael's email brought it all back though! And yes, I made Michael promise that our first weekend in Japan would be spent at Tokyo Disneyland. What an experience that was! More Japan Stories coming next week!